Showcasing an extensive portfolio of mPOS customer receipting, online ordering, inventory labelling, ticketing and kiosk printing applications BIXOLON Co.,Ltd, a leading global manufacturer of advanced Mobile, Label and POS printers, will be demonstrating its innovative range of printing solutions on stand N11, at Seamless Middle East 2019 in Dubai, Arab Emirates. Throughout this year’s show BIXOLON will be exhibiting a range of 2 inch, 3 inch and 4 inch mobile printing solutions. Including the SPP-L3000 3-inch mobile label printer equipped with peeler and LCD display. Alongside the anticipated SPP-A200 2-inch mobile sled printer, equipped with the Miura M020 mobile pin-pad and the SPP-L310 3-inch semi mobile label printer for small and medium volume mobile labelling applications. Supporting Warehouse, Logistics, Manufacturing and Retail companies with their linerless and label printing requirements, BIXOLON will be demonstrating its comprehensive Label printer line-up. Beginning with the SRP-S300 3-inch linerless label printer with Taken Sensor™ which is ideal for online ordering applications. The SLP-DX220 2-inch Bluetooth label printer for food and drink labelling, and the new XT5-40 4-inch industrial label printer, supports 203 dpi, 300 dpi, and 600 dpi print resolution options, ideal for retail inventory management. 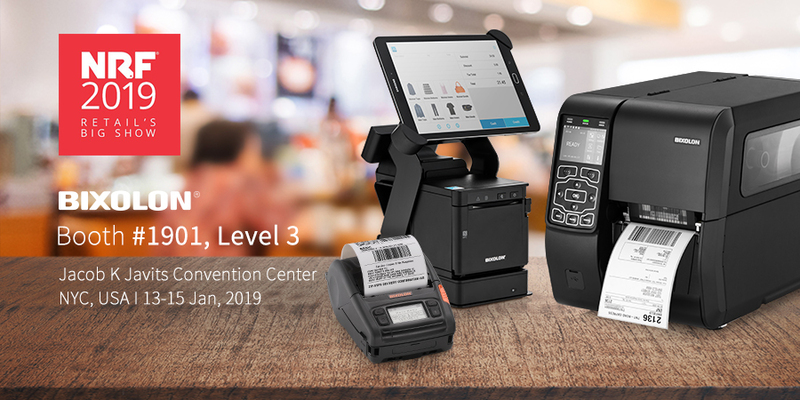 Introducing visitors to the future of receipting, BIXOLON will be showcasing two mPOS printers, the SRP-Q300H featuring an intelligent hub(B-gate) connecting up to 4 USB peripherals devices to the host tablet via Bluetooth and providing a single charging port. Alongside the SRP-Q300B, a 3-inch thermal cube printer with built-in battery supporting a 24V Li-ion 2,750mAh rechargeable battery, ideal for standalone pop-up stores, queue busting and more. While launching the BK3-31 3-inch open frame kiosk printer to the Middle Eastern market. “Seamless Middle East provides the perfect platform to showcase our new products illustrating BIXOLON’s years of industry leading knowledge and expertise,” cites John Kim, BIXOLON’s Marketing Director. “Retailers are welcome to visit our booth and learn about how to intentionally reduce expenses and take advantage of the value our products have to offer.” For more information visit www.Bixolon.com, subscribe to blog.bixolon.com or alternatively speak to your local BIXOLON sales representative. 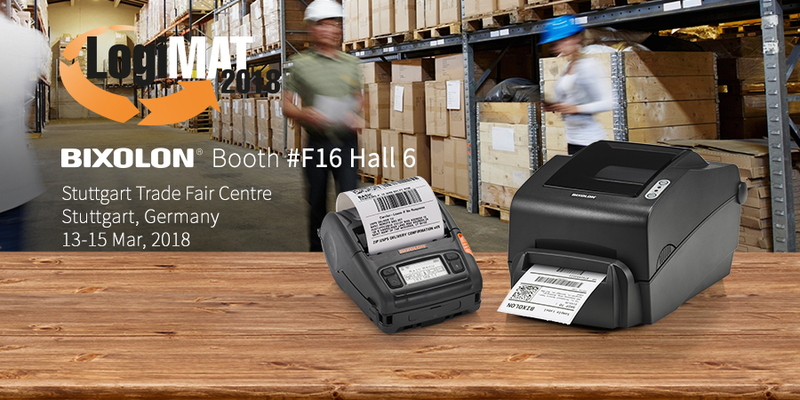 BIXOLON Europe GmbH, a global leading Mobile, Label and POS printer manufacturer will be partnering with CipherLab in Hall 1, stand C39 to demonstrate its comprehensive range of Transport, Logistics and Warehouse printing solutions. Demonstrating the role label printing technology plays in the logistics automatic identification, tracking and shipping process, BIXOLON will be showcasing a range of desktop labelling solutions. Including the SLP-TX400 4-inch (116mm) barcode label printer with external paper supplier for high volume labelling. The SLP-TX420 4-inch (110mm) Thermal Transfer and SLP-DX420 4-inch (110mm) Direct Thermal label printers for packaging and shipping label solutions. The SLP-TX220 and SLP-DX220 2-inch (60mm) printers for label tracking and banding identification. The SRP-E770III 4-inch (106mm) economical direct thermal label printer. Plus a first look at the XT5-40 4-inch (114mm) industrial label printer supporting 203, 300 and 600dpi print resolution launching in April 2019. BIXOLON will also be inviting visitors to explore the latest innovations in mobile printing, through its growing range of 2-inch, 3-inch and 4-inch mobile receipt, ticket and label printing solutions. Including the next generation SPP-R310plus, 3-inch (80mm) mobile receipt and linerless label printer featuring Bluetooth 4.1 and dual-band connectivity. The SPP-L3000, BIXOLON’s first 3-inch (80mm) heavy label mobile printing solution and the NEW SPP-L310 3-inch (80mm) label mobile printer for medium volume label printing applications. Complimented by its comprehensive range of charging and carrying accessories. “The Logistics market has always been an important sector for BIXOLON. SiTL provides us with the platform to connect directly with the key players within the European Logistics industry,” explains Charlie Kim, Managing Director, BIXOLON Europe GmbH. “Partnering with Cipherlab throughout the event provides our visitors with the opportunity to see our printing solutions working in tandem with their industry leading range of Automatic Identification and Data Capture/Collection (AIDC) products to give a true representation of their purpose within a Logistics environment.” To find out more, visit BIXOLON at www.Bixolon.com or alternatively speak to your local BIXOLON sales representative. 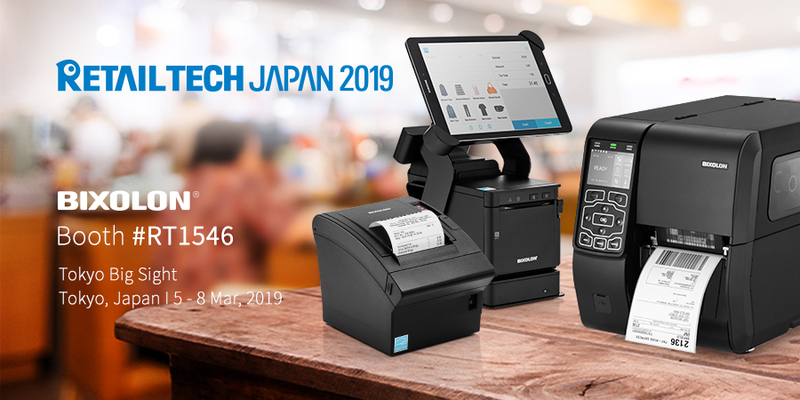 Inspiring visitors with industry-leading receipt printing solutions designed for Japan’s Retail MarketBIXOLON Co.,Ltd, a leading global manufacturer of advanced Mobile, Label and POS printers, will be showcasing its latest range of printing solutions on stand RT1546 at Retailtech 2019 in Tokyo, Japan. Showcasing innovative technology and products that allow retailers to enhance their work efficiency in a wide range of applications to achieve a competitive edge in order to stand out in the market. 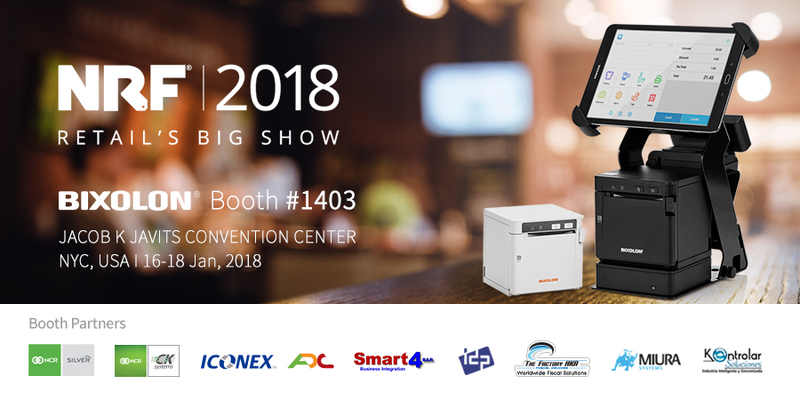 Throughout this year’s show BIXOLON will be inspiring visitors at the event with SRP-383 3-inch thermal receipt printer, specifically built for Japanese market where high print quality is essential when choosing a printer using 2-byte fonts. Offering 300dpi, the highest resolution among the POS printers, the SRP-383 is ideal for Retail, Hospitality, Healthcare and Insurance industries where receipts with high density content is often required. Additionally, BIXOLON will be demonstrating the SRP-S300 linerless label printer with Taken Sensor™ ideal for online ordering applications.﻿ BIXOLON will also be displaying its full range of 2”, 3” and 4” mobile printing solutions, some of which feature SoftAP network support for simple Wi-Fi Access and Smart Connection™ Technology, enabling easy wireless communication between host devices and printers. Including the SPP-R310plus next generation 3-inch mobile printer, providing Bluetooth 4.1 and dual-band Wi-Fi connectivity add-ons. Alongside the SPP-L3000 3-inch mobile label printer equipped with a peeler and LCD display.﻿ Visitors are also invited to a first look at a number of BIXOLON’s new products, including the SPP-A200 2-inch mobile printer, equipped with mobile pin-pad. The XT5-40 4-inch industrial label printer, supporting 203 dpi, 300 dpi, and 600 dpi print resolution options with fast data processing and print speeds. Together with the SPP-L410 4-inch mobile label printer. ﻿ “Retailtech Japan provides the perfect springboard place for us to introduce our new products illustrating BIXOLON’s years of industry leading knowledge and expertise,” cites John Kim, BIXOLON’s Marketing Director. “Retailers are welcome to visit our booth and learn about how to dramatically reduce expenses and take advantage of the value our products offer.”﻿ BIXOLON will also be hosting a technology partner, IT Village, who will be showcasing 'i-Order', an integrated distribution and sales management solution.﻿ For more information visit www.Bixolon.com, subscribe to blog.bixolon.com or alternatively speak to your local BIXOLON sales representative. 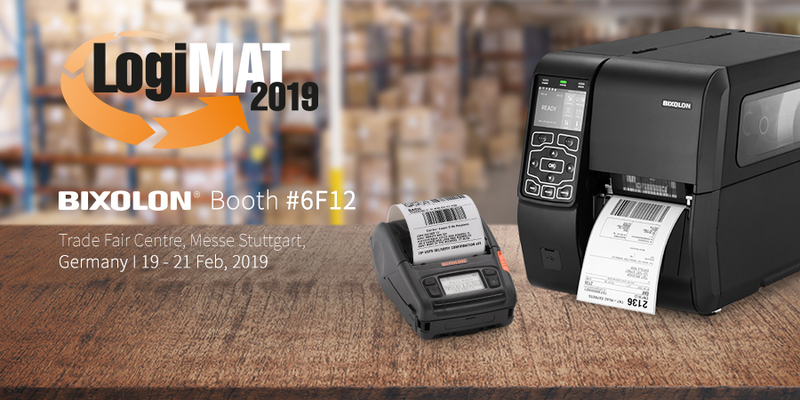 LogiMAT (19th – 21st February, Stuttgart Germany) – BIXOLON Europe GmbH, a global leading Mobile, Label and POS printer manufacturer demonstrating its latest range of printing solutions for the Transport, Logistics and Warehouse market on stand 6F12 at LogiMAT 2019. Understanding the role label printing technology plays in the automatic identification and tracking throughout all areas of the logistics industry, BIXOLON will be demonstrating the SRP-S300 3-inch (80mm) linerless label printer with Taken Sensor™ and eco features ideal for shelf & rack labelling and more. Alongside the SLP-TX420R 4-inch (110mm) label barcode label printer with RFID data encoding functions. The SLP-DX420 4-inch (108mm) and SLP-DL410 4” (108mm) for shipping label solutions and the SLP-DX220 2-inch (60mm) ideal for tracking label solution. The SRP-E770III 4-inch (106mm) economical direct thermal printer. Plus offering a first look at the XT5-40 4-inch (114mm) industrial label printer supporting 203, 300 and 600dpi print resolution which will be launched imminently. Inspiring the visitors of LogiMAT with the latest and most innovative mobile printing technologies, BIXOLON will be exhibiting its industry range of 2-inch, 3-inch and 4-inch range of mobile printing solutions including the next generation SPP-R310plus 3-inch (80mm) mobile printer featuring Bluetooth 4.1 and dual-band connectivity. The NEW SPP-L3000, BIXOLON’s first 3-inch (80mm) heavy label mobile printing solution. Alongside the hotly anticipated SPP-L310 3-inch (80mm) label mobile printer for medium volume label printing applications. As Charlie Kim, Managing Director, BIXOLON Europe GmbH, states, “With an in-depth knowledge and understanding of the logistics landscape and the challenges the industry faces, BIXOLON has developed an innovative range of mobile and label printing solutions which meet the requirements of this sector. Partnering with the technology elite within the industry such as mobit ag (Switzerland) who will be joining BIXOLON on the stand throughout, showcasing their latest mobile computing hardware and label printing solution software, demonstrating BIXOLON’s commitment to supporting the market.” To find out more, visit BIXOLON at www.Bixolon.com or alternatively speak to your local BIXOLON sales representative. Showcasing an extensive portfolio of dynamic printing solutions for any application EuroCIS (19th – 21st February, Düsseldorf, Germany) – BIXOLON Europe GmbH, a global leading Mobile, Label and POS printer manufacturer will be encouraging visitors to the BIXOLON stand 9D32 at EuroCIS 2019. Showcasing a range of innovative printing solutions that can easily be upgraded as your system evolves. From complex omni-channel retail systems to simple pop-up ticketing setups, delivery labelling or kiosk applications BIXOLON’s experience within the Retail, Hospitality and Logistics environments mean that they can provide tailored printing solutions for independent traders through to multi-national corporations.Key product highlights will include:•POS Receipt and Ticketing – Showcasing BIXOLON’s SRP-Q300 3-inch (80mm) Direct Thermal cube desktop printer series offering flexible mPOS receipt and ticket printing. Including the SRP-QE300 entry-level printer with USB and Ethernet connectivity, plus 200mm/sec print speeds and 180dpi print resolution. SRP-Q300H featuring an intelligent hub (B-gate), connecting up to 4 USB peripheral devices (scanner, cash drawer, customer display, RFID reader, scales, etc.) to the host tablet (via Bluetooth) and providing a single charging port. Alongside the standalone SRP-Q300B with built-in battery supporting a 24V Li-ion 2,750mAh rechargeable battery ideal for pop-up stores, queue busting and more. Educating visitors throughout the show, BIXOLON will be demonstrating the SRP-S300 3-inch (80mm) linerless label printer with Taken Sensor™ and eco features ideal for food labelling and more.•Desktop Label Innovation –The SLP-TX420R 4-inch (110mm) label barcode label printer with RFID data encoding functions. The SRP-E770III 4-inch (106mm) economical direct thermal printer. Plus offering a first look at the TX5-40 4-inch (114mm) industrial label printer supporting 203, 300 and 600dpi print resolution which will be launched imminently.•Mobile Receipt and Labelling – BIXOLON will be exhibiting its industry range of 2-inch, 3-inch and 4-inch range of mobile printing solutions including the next generation SPP-R310plus 3-inch (80mm) mobile receipt printer featuring Bluetooth 4.1 and dual-band connectivity. The NEW SPP-L3000, BIXOLON’s first 3-inch (80mm) heavy label mobile printing solution. Alongside the hotly anticipated SPP-L310 3-inch (80mm) label mobile printer for medium volume label printing applications and the SPP-A200 mobile printer equipping with mobile pin-pad. “EuroCIS is a key European industry event for BIXOLON providing us with the opportunity to network with the key players across a range of industries,” cited John Kim, Marketing Director, BIXOLON Ltd. “BIXOLON will be taking this opportunity to showcase its exciting range of POS, Mobile and Label printing solutions, echoing its ongoing dedication to provide a comprehensive range of printing applications adaptable for any budget or market.” Technology PartnersBIXOLON will host a range of technology hardware and software partners, including plastic card printing from IDP, Retail POS printing application from Lundi Matin, Mobile Payment Solution from SumUp and a Fiscal solution from The Factory HKA on its stand throughout the show. “BIXOLON has built up strong relationships with a range of organisations from all types of industries across Europe,” explains Charlie Kim, Managing Director. “EuroCIS provides BIXOLON the platform to showcase these ongoing partnership successes while demonstrating the flexibility of its solutions in the progressive technological marketplace.” For more information visit http://www.bixolon.com/, http://blog.bixolon.com/ or alternatively speak to your local BIXOLON sales representative. Showcasing an Extensive Portfolio of mPOS customer receipting, online ordering, delivery labeling, ticketing and kiosk printing applications BIXOLON America, Inc., a leading global manufacturer of advanced Mobile, Label and POS printers, will be showcasing its latest range of dynamic printing solutions for a range of trend sensitive applications, from food prep labeling to online order printing on stand 1901, Lev3 at NRF Retail’s Big Show 2019. Throughout the show BIXOLON will be exhibiting its full range of 2”, 3” and 4” mobile printing solutions. Including the SPP-R310plus next generation 3-inch mobile printer featuring Bluetooth 4.1 and dual-band Wi-Fi connectivity add-ons. Alongside the SPP-L3000 3-inch mobile label printer equipped with a peeler and LCD display. Plus the recently launched SPP-L310 3-inch mobile label printer for small to medium volume mobile labeling applications. 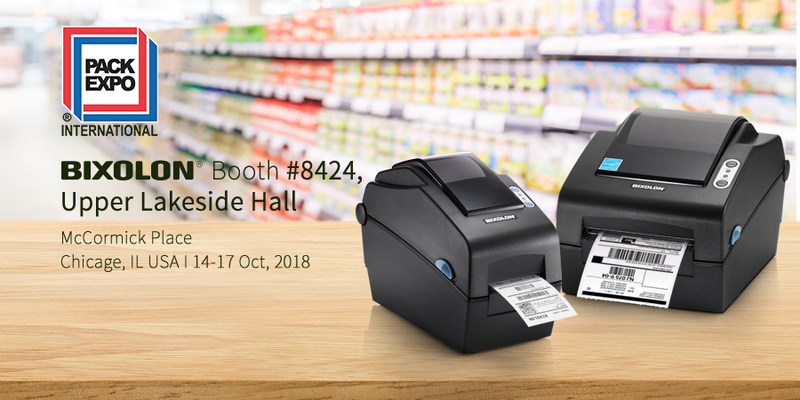 Inspiring retailers with linerless and label printing, BIXOLON will be demonstrating the SRP-S300 linerless label printer ideal for online ordering applications, SLP-DX220 2-inch label printer for MRD (Make, Ready, Discard) applications, SLP-TX220 for wristband printing, SLP-DX420 and SLP-DL410 for shipping label solutions and the SLP-TX400R 4-inch barcode label printer with RFID data encoding functions. Additionally BIXOLON will feature devices such as the SRP-S300 3-inch linerless label printer with Taken Sensor™. The SRP-Q300 3-inch Direct Thermal cube desktop printer series with flexible mPOS printing. The SRP-Q300H featuring an intelligent hub (B-gate) connecting up to 4 USB peripheral devices (scanner, cash drawer, customer display, RFID reader, scales, etc.) to the host tablet (via Bluetooth). Alongside the SRP-Q300B 3-inch Direct Thermal cube printer supporting a 24V Li-ion 2,750mAh rechargeable battery. BIXOLON will also be providing a first looks at a number of its future 2019 product launches, including the XT5-40 4-inch industrial label printer supporting 203 dpi, 300 dpi, and 600 dpi print resolution options. The world’s first 3-inch thermal receipt printer supporting 300 dpi resolutions, the SRP-383. BIXOLON’s BK3-31 3-inch kiosk printer, the SPP-A200 2-inch mobile printer equipping with mobile pin-pad and the SPP-L410 4-inch mobile label printer. “The NRF Retail’s Big Show is one of the most important industry events of the year for BIXOLON. We look forward to attending and engaging with other leaders in the Retail and Hospitality industry,” states Paul Kim, Managing Director of BIXOLON America. “We will be inspiring visitors of NRF with the latest food prep and online ordering applications, alongside BIXOLON’s linerless labelling cannabis printing solutions with Taken Sensor™ technology.” Technology Partners ​BIXOLON will also be hosting complementary hardware and software technology partners on the stand, including NCR Silver Cloud POS Solution and C&K Systems showcasing an NCR CounterPoint all-in-one terminal with BIXOLON’s SRP-350plusIII receipt printer and SLP-DX220 label printer. Iconex featuring the SRP-S300 and SPP-R310 printers for restaurant linerless labeling applications. eHopper showcasing point of sale software. Mariner Business Solutions introducing Cannabis POS solutions, The Factory HKA demonstrating Fiscal solutions and Smart 4 B&R showcasing an OXXO fuel dispenser with integrated SRP-Q302 receipt printer. For more information visit www.BixolonUSA.com, subscribe to blog.bixolon.com or alternatively speak to your local BIXOLON sales representative. 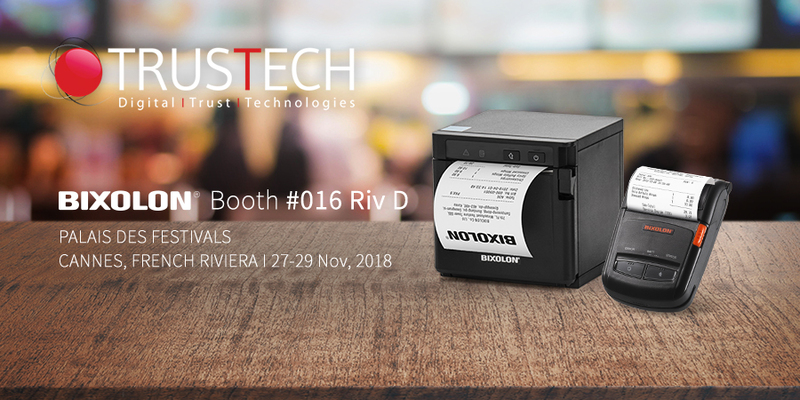 TRUSTECH (27-29 November 2018, Cannes, France) – BIXOLON, a leading global manufacturer of advanced Mobile, Label and POS printers, will be joining IDP Corp Ltd., a leading ID card printer manufacturer, to showcase its latest range of dynamic printing solutions for a range of trend sensitive applications, from digital payment commerce to multi-platform ecosystems on stand Riv D 016 at TRUSTECH 2018. Redefining POS printing, BIXOLON will be exhibiting the SRP-Q300 80mm (3-inch) Direct Thermal cube desktop printer series offering flexible mPOS printing at competitive pricing. Including the SRP-Q300H featuring an intelligent hub (B-gate), connecting up to 4 USB peripheral devices (scanner, cash drawer, customer display, RFID reader, scales, etc.) to the host tablet (via Bluetooth) and providing a single charging port. Alongside the NEW SRP-Q300B Direct Thermal cube Receipt and Ticket printer with built-in battery supporting a 24V Li-ion 2,750mAh rechargeable battery ideal for standalone pop-up stores, queue busting and more. Showcasing a range of dynamic printing solutions, BIXOLON also will be demonstrating their cost-effective, highly reliable SRP-330II 80mm (3-inch) POS printer with All-In-One Plus™ Interface. The SRP-S300 3-inch linerless label printer with Taken Sensor™. In addition to the robust SLP-TX420, a 112mm (4-inch) Thermal Transfer label printer. Alongside the premium SLP-DX220, a 58mm (2-inch) compact Bluetooth label Thermal Transfer printer ideal for inventory management and retail labelling. Celebrating its fifth consecutive year as the Global No1 Mobile Receipt Printer Manufacturer, as quoted by independent Japanese Research Company Chunichisha, BIXOLON will be displaying its comprehensive range of 58mm (2-inch), 80mm (3-inch) and 112mm (4-inch) mobile receipt and label printing solutions, including the newly released SPP-L3000. An 80mm (3-inch) premium level Auto-ID Mobile Label Printer supporting high quality connectivity and labelling. Ideal for a range of applications including supply chain labelling, retail tags, delivery invoicing and more. “Europe continues to be one of the fastest growing multi-platform markets in the world,” explains Charlie Kim, Managing Director, BIXOLON Europe GmbH. “Reaffirming BIXOLON’s ongoing commitment into printing research and development, to provide a sophisticated portfolio Mobile, POS and Label printing solutions to meet its evolving customer requirements.” About BIXOLON BIXOLON is a leading global manufacturer of innovative, advanced printing technologies including point-of-sale receipt, label, Auto ID and mobile printers for a wide range of environments. Millions of BIXOLON printers are used today in retail, hospitality, healthcare, banking, ticketing, post/parcel, warehousing and other transaction-intensive industries. In 2018, for the fifth consecutive year BIXOLON was named global mobile receipt printer market leader by Japanese research company Chunichisha. About IDP Corp., Ltd. IDP is a leading ID Card Printer manufacturer who is dedicated to making better ID Card Printers with diverse and innovative technology. The IDP difference is to provide high quality products with the latest technology, offering quick friendly support and industry leading warranties. IDP strives to make card printing available to all by offering high quality, affordable and simple to use systems for small and large organizations. Showcasing an Extensive Portfolio of Logistics Label, Linerless Label and Mobile Label Printing TechnologyPACK EXPO (14th – 17th October 2018, Chicago, USA) – BIXOLON Co., Ltd a global leading mobile, label and POS printer manufacturer will be encouraging its visitors to explore the latest in Auto ID label printing solutions for the American market on BIXOLON’s booth #8424, Upper Lakeside Hall at PACK EXPO 2018.Showcasing the recently launched SLP-TX400R, a 4-inch desktop thermal transfer label printer with RFID technology and 7 IPS (178 mm/s) speed. Supporting USB, Ethernet and Serial as standard with optional Bluetooth or WLAN interface. Alongside an optional auto-cutter and external label holder for higher-volume label rolls. The label printer can also simultaneously print and embedded UHF RFID code into inventory labelling, price tags and more.BIXOLON will also be demonstrating its range of compact, robust and intelligent Bluetooth Direct Thermal desktop labelling solutions on the stand. Including its 2-inch SLP-DX220, 4-inch SLP-DX420, and specialised 4-inch SLP-DL410 Direct Thermal Bluetooth fan-fold label printer. BIXOLON’s desktop labelling solutions are compatible with label design software including BIXOLON’s free-of-charge Label Artist™, Label Artist™ Mobile for iOS™ and Android™, alongside the industry leading BarTender® and BarTender® UltraLite for BIXOLON.Also ahead of its launch later this year, BIXOLON is showcasing 3-inch mobile label printer SPP-L3000 with 5 IPS (127 mm/s) speed. This mobile printer features an easy-to-open peeler, IP54 dust protected splash proof design and 2.1m (7 ft.) drop test reliability. Supporting WLAN Dual band (5 GHz and 2.4 GHz), Bluetooth V 4.1 Classic and LE and NFC. The SPP-L3000 is the perfect printing solution for traditional supply chain, omni-channel retailing and field service operations.BIXOLON will also be encouraging visitors to meet its recently launched B-linerless™ linerless label consumables. Available in two types of adhesive strengths, B-linerless™ Permanent which features a permanent adhesive across the whole media sharing similarities with traditional liner labels. Alongside B-linerless™ Restick, supporting a removable and repositionable adhesive across the media eliminating adhesive residue left when removed.“PACK EXPO provides us with the platform to connect directly with the key players within the American Packaging industry,” states Alberto Hwang, Managing Director of BIXOLON America. “BIXOLON will be looking to inspire visitors to the show with its latest innovative AIDC label printing technologies.”For more information visit http://www.bixolon.com/, http://blog.bixolon.com/ or alternatively speak to your local BIXOLON sales representative.About BIXOLON BIXOLON is a leading global manufacturer of innovative, advanced printing technologies including point-of-sale receipt, label, Auto ID and mobile printers for a wide range of environments. Millions of BIXOLON printers are used today in retail, hospitality, healthcare, banking, ticketing, post/parcel, warehousing and other transaction-intensive industries. In 2018, for the fifth consecutive year BIXOLON was named global mobile receipt printer market leader by Japanese research company Chunichisha. Showcasing the Highlights of its Logistics Labelling, Ticketing and Receipting Printing TechnologyPOST-EXPO (9 -11 October 2018, Hamburg, Germany) – BIXOLON (stand B1.120), a leading global manufacturer of advanced Mobile Label and POS printers, will be showcasing products from its portfolio of Auto-ID logistics printing solutions throughout the show. Designs that offer cutting edging labelling technology for the transport and logistics market, BIXOLON will be demonstrating the two NEW 4-inch direct thermal printing solutions, the SLP-DX420C designed for new patented labelling media and the SLP-DX420CT for linerless labelling solutions. Alongside will be the new XT5-40 industrial 4-inch thermal transfer printer, BIXOLON’s first heavy-duty printer aimed at the high volume, industrial printing market.BIXOLON will also be celebrating its fifth consecutive year as the Global No.1 Mobile Receipt Printer Manufacturer as quoted by independent Japanese Research Company Chunichisha. Exhibiting its comprehensive range of 2”, 3” and 4” mobile printing solutions compatible with industry leading mobile and PDA technology. Including the 2-inch SPP-R200III highly mobile printer with Bluetooth, Wi-Fi, USB and Serial connectivity. The updated 3-inch mobile printer the SPP-R310plus, features enhanced add-ons including Bluetooth 4.1 and dual-band Wi-Fi. Plus the 4-inch SPP-R410 rugged mobile printer with NFC auto-pairing.“POST-EXPO provides the perfect platform for BIXOLON to meet the key decision makers within the global postal and parcel market,” explains Charlie Kim, Managing Director, BIXOLON Europe GmbH. “Enabling BIXOLON to showcase highlights from its growing portfolio of cutting edge labelling, ticketing and mobile technologies for this rapidly growing market.”- o -About BIXOLON BIXOLON is a leading global manufacturer of innovative, advanced printing technologies including point-of-sale receipt, label, Auto ID and mobile printers for a wide range of environments. Millions of BIXOLON printers are used today in retail, hospitality, healthcare, banking, ticketing, post/parcel, warehousing and other transaction-intensive industries. In 2018, for the fifth consecutive year BIXOLON was named global mobile receipt printer market leader by Japanese research company Chunichisha. 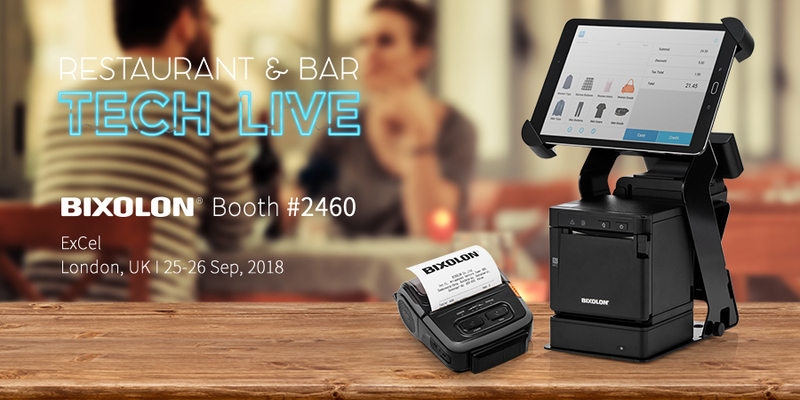 Restaurant and Bar Tech Live 2018 (25-26 September 2018, London, UK) - BIXOLON (stand 2460) a leading global manufacturer of advanced Mobile Label and POS printers, will be encouraging visitors to explore its exciting range of Hospitality printing solutions throughout the show.Highlighting the ongoing requirement for flexible, hospitality printing solutions, BIXOLON will be showcasing its multi-functional SRP-Q300 3-inch (80mm) Direct Thermal cube desktop printer series with flexible mPOS printing. Including the SRP-QE300 entry-level printer with USB and Ethernet connectivity, plus 200mm/sec print speeds and 180dpi print resolution. SRP-Q300H featuring an intelligent hub (B-gate), connecting up to 4 USB peripheral devices (scanner, cash drawer, customer display, RFID reader, scales, etc.) to the host tablet (via Bluetooth) and providing a single charging port. Alongside the NEW SRP-Q300B 3-inch (80mm) Direct Thermal cube Receipt and Ticket printer with built-in battery supporting a 24V Li-ion 2,750mAh rechargeable battery ideal for alfresco dining, food trucks and more.Celebrating its fifth consecutive year as the Global No1 Mobile Receipt Printer Manufacturer as quoted by independent Japanese Research Company Chunichisha, BIXOLON will also be exhibiting its comprehensive range of 2”, 3” and 4” mobile printing solutions throughout the show. Including its recently launched next generation 3-inch mobile printer the SPP-R310plus, featuring enhanced connectivity add-ons including Bluetooth 4.1 and dual-band Wi-Fi connectivity.In addition BIXOLON will feature devices such as the SRP-S300 3-inch linerless label printer with Taken Sensor™, the highly reliable, ergonomic SRP-275III dot-matrix kitchen printer and SRP-F310II economic, splash resistant, 3” front exit, direct thermal receipt printer. Alongside the SRP-E770III economical 4-inch direct thermal label printer, boasting print speeds of 127mm/sec and 203dpi print quality to produce high quality text, graphics and barcodes for all types of label for fast food orders, food labelling and more.“Restaurant and Bar Tech Live provides the perfect platform to showcase the latest in hospitality printing innovation,” cites Charlie Kim, Managing Director, BIXOLON Europe GmbH. “The show will allow BIXOLON to exhibit its latest cutting edge printing technology and highlight its on-going dedication to developing and pushing the boundaries of technology within the hospitality market.”- o -About BIXOLON BIXOLON is a leading global manufacturer of innovative, advanced printing technologies including point-of-sale receipt, label, Auto ID and mobile printers for a wide range of environments. Millions of BIXOLON printers are used today in retail, hospitality, healthcare, banking, ticketing, post/parcel, warehousing and other transaction-intensive industries. In 2018, for the fifth consecutive year BIXOLON was named global mobile receipt printer market leader by Japanese research company Chunichisha.For more information visit http://www.bixolon.com/ or contact your local BIXOLON Sales representative. 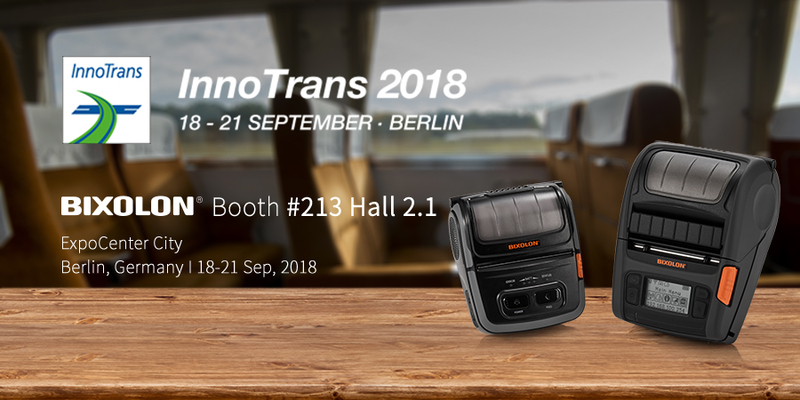 Showcasing an Extensive Portfolio of Logistics Labelling, Receipting and Mobile Printing TechnologyInnoTrans (18-21 September 2018, Berlin, Germany) – BIXOLON (stand 213), a leading global manufacturer of advanced Mobile Label and POS printers, will be showcasing its complete portfolio of Auto-ID logistics printing solutions throughout the show for a range of applications from post and parcel delivery to shipping labels, transport ticketing and kiosks.Highlighting the ongoing requirement for label printing within the Transport and Logistics market, BIXOLON will be demonstrating its range of compact, robust and intelligent Bluetooth Direct Thermal and Thermal Transfer desktop labelling solutions on the stand. Including the NEW SRP-E770III economical 4-inch direct thermal label printer boasting print speeds of 127mm/sec and 203dpi print quality to produce high quality text, graphics and barcodes for all types of label. Alongside the 2” SLP-TX220 and SLP-DX220 and 4” SLP-TX420 & SLP-DX420. The specialised 4” SLP-DL410 Direct Thermal Bluetooth fan-fold label printer. The 4” SLP-TX400 and SLP-T400 high throughput desktop labelling printers. BIXOLON’s desktop labelling solutions are fully compatible with market-leading programming languages such as SLCS, BPL-Z™ and BPL-E™ and support editable label printing from popular applications such as Bartender®, Label Artist™ plus the newly launched Label Artist™ Mobile for iOS™ and Android™.Bridging the gap between label and mobile printing, BIXOLON will be showcasing the NEW SPP-L3000, mobile label printer due out later this year. Its first 3-inch embedded Linux mobile printer with 5 IPS speed launching in 2018. SPP-L3000 is compact, lightweight mobile printer with an easy-to-open peeler. Supporting WLAN Dual band (5 GHz and 2.4 GHz), Bluetooth V 4.1 Classic and LE. The perfect printing solution for delivery invoicing, supply chain labelling, inventory management and more.BIXOLON will also be celebrating its fifth consecutive year as the Global No.1 Mobile Receipt Printer Manufacturer as quoted by independent Japanese Research Company Chunichisha, BIXOLON will also be exhibiting its comprehensive range of 2”, 3” and 4” mobile printing solutions compatible with industry leading mobile and PDA technology. Including its recently launched next generation 3-inch mobile printer the SPP-R310plus, featuring enhanced connectivity add-ons including Bluetooth 4.1 and dual-band Wi-Fi connectivity. Alongside a selection of mobile printer accessories.“InnoTrans provides the perfect platform for customers to explore the latest in printing innovation for the Transport and Logistics market,” cites Charlie Kim, Managing Director, BIXOLON Europe GmbH. “Showcasing a complete portfolio of Label, Mobile and POS printing solutions throughout the show highlights BIXOLON’s ongoing dedication to developing and pushing the boundaries of technology within the market.”- o -About BIXOLON BIXOLON is a leading global manufacturer of innovative, advanced printing technologies including point-of-sale receipt, label, Auto ID and mobile printers for a wide range of environments. Millions of BIXOLON printers are used today in retail, hospitality, healthcare, banking, ticketing, post/parcel, warehousing and other transaction-intensive industries. In 2018, for the fifth consecutive year BIXOLON was named global mobile receipt printer market leader by Japanese research company Chunichisha.For more information visit http://www.bixolon.com or contact your local BIXOLON Sales representative. 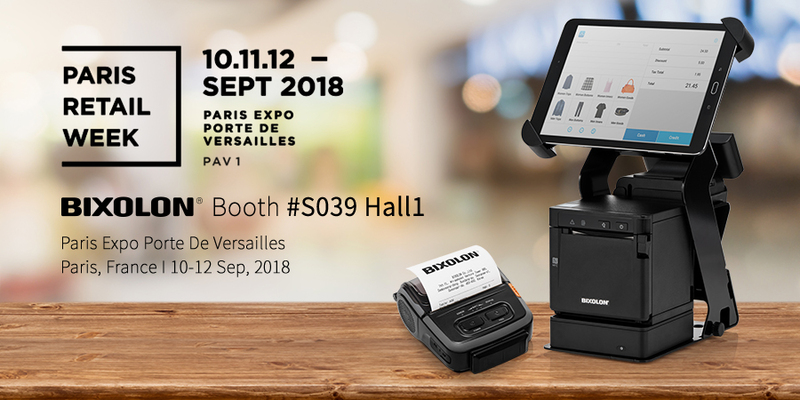 Showcasing the future of POS, Label and Mobile Printing TechnologyParis Retail Week (10-12 September 2018, Paris, France) – BIXOLON a leading global manufacturer of advanced Mobile Label and POS printers, will be encouraging visitors onto the BIXOLON stand S 039 at Paris Retail Week 2018 to explore the future of printing technology for today’s complex Retail market.Celebrating its fifth consecutive year as the Global No1 Mobile Receipt Printer Manufacturer as quoted by independent Japanese Research Company Chunichisha, BIXOLON will also be exhibiting its comprehensive range of 2”, 3” and 4” mobile printing solutions. Including its recently launched next generation 3-inch mobile printer the SPP-R310plus, featuring enhanced connectivity add-ons including Bluetooth 4.1 and dual-band Wi-Fi connectivity.Inspiring retailers with the future of POS receipt printing, BIXOLON will be exhibiting the SRP-Q300 3-inch (80mm) Direct Thermal cube desktop printer series offering flexible mPOS printing. Including the SRP-QE300 entry-level printer with USB and Ethernet connectivity, plus 200mm/sec print speeds and 180dpi print resolution. SRP-Q300H featuring an intelligent hub (B-gate), connecting up to 4 USB peripheral devices (scanner, cash drawer, customer display, RFID reader, scales, etc.) to the host tablet (via Bluetooth) and providing a single charging port. Alongside the NEW SRP-Q300B 3-inch (80mm) Direct Thermal cube Receipt and Ticket printer with built-in battery supporting a 24V Li-ion 2,750mAh rechargeable battery ideal for standalone pop-up stores, queue busting and more.In addition, BIXOLON will feature devices such as the SRP-S300 3-inch linerless label printer with Taken Sensor™. Alongside the SRP-E770III economical 4-inch direct thermal label printer boasting print speeds of 127mm/sec and 203dpi print quality to produce high quality text, graphics and barcodes for all types of label.BIXOLON will also be joined on the stand by SAS Lundi Matin showcasing their RoverCash Retail mPOS software suite for Android™ and iOS™. The mPOS solution enables users to manage stock levels, simply process customer payments, track financial credentials and monitor customer loyalty.“BIXOLON will be showcasing a range of innovative POS Label and Mobile printing solutions to fit any budget, from simple pop-up store setups to complex multi-channel retail systems,” explains Charlie Kim, Managing Director, BIXOLON Europe GmbH. “BIXOLON’s range of printing solutions can easily be upgraded as your requirements evolve tailoring printing solutions from Independent Traders through to Major Retailers.”- o -About BIXOLON BIXOLON is a leading global manufacturer of innovative, advanced printing technologies including point-of-sale receipt, label, Auto ID and mobile printers for a wide range of environments. Millions of BIXOLON printers are used today in retail, hospitality, healthcare, banking, ticketing, post/parcel, warehousing and other transaction-intensive industries. In 2018, for the fifth consecutive year BIXOLON was named global mobile receipt printer market leader by Japanese research company Chunichisha.For more information visit http://www.bixolon.com or contact your local BIXOLON Sales representative. 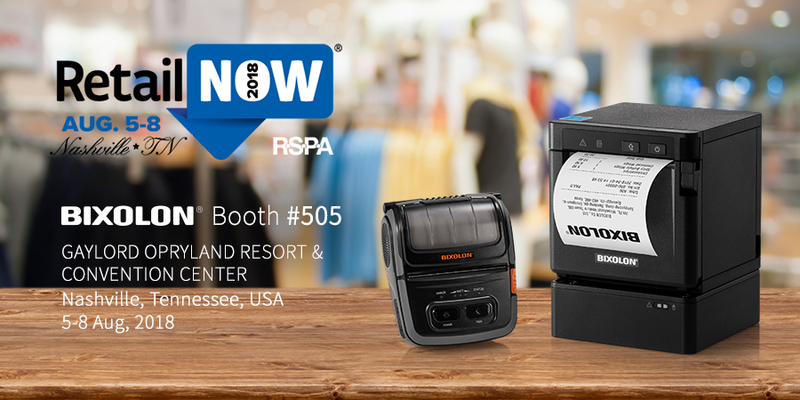 BIXOLON America, Inc. (booth 505) is pleased to announce that they will be returning for this year’s RSPA RetailNOW® show (5th-8th August 2018, Tennessee, USA), showcasing some of the most innovative, fast-paced mPOS solutions in the POS world. BIXOLON is a global manufacturer of advanced receipt, label and mobile printers and has had a longstanding presence at the show. As the mPOS market continues to grow, BIXOLON has continuously been ahead of the curve in designing groundbreaking devices to meet the need for today’s most demanding applications. BIXOLON will introduce the all new SRP-Q302B built-in battery 3-inch mPOS printer. A compact cube design printer offering a small footprint and added mobility with its 24 V Li-ion, 2,750 mAh, rechargeable battery. Supporting up to 220 mm/sec print speed, USB + Ethernet + 1 USB charging-only port interface as a standard, alongside WLAN or Bluetooth options. In addition, BIXOLON will feature devices such as the SPP-R310plus 3-inch mobile printer and the SRP-S300 3-inch linerless label printer with Taken Sensor™. The SRP-F310II water and dust resistant receipt printer offering an unlimited 4 year warranty, alongside the SLP-DX420 built-in Bluetooth 4-inch direct thermal desktop label printer. “The RSPA RetailNOW® show is one of the most important industry events of the year for BIXOLON. We look forward to attending and engaging with other leaders in the Retail and Hospitality industry,” states Alberto Hwang, Managing Director of BIXOLON America. “We will be inspiring visitors of RetailNow with the latest and most innovative mPOS printing technologies for QSR applications, alongside its market leading mobile and desktop printers specifically designed for linerless labelling.” About BIXOLON BIXOLON is a leading global manufacturer of innovative, advanced printing technologies including point-of-sale receipt, label, Auto ID and mobile printers for a wide range of environments. Millions of BIXOLON printers are used today in retail, hospitality, healthcare, banking, ticketing, post/parcel, warehousing and other transaction-intensive industries. In 2018, for the fifth consecutive year BIXOLON was named global mobile receipt printer market leader by Japanese research company Chunichisha. For more information visit http://www.bixolon.com or contact your local BIXOLON sales representative. Showcasing the latest in Retail Receipt, label and mobile printing Stand E138 at Retail Business Technology Expo (RBTE) 2-3 May, Olympia, London, UK Showcasing our extensive portfolio of innovative Retail POS, Label and Mobile printing solutions Joined by GoEPOS with their next generation iOS Tablet EPOS/Cloud Based Solution Retail Business Technology Expo 2018 (2nd – 3rd May 2018, London, UK)– BIXOLON Co., Ltd a global leading Mobile, Label and POS printer manufacturer will be encouraging visitors to the BIXOLON stand E138 at RBTE 2018. Showcasing a range of innovative POS, label and mobile printing solutions that can easily be upgraded at your system evolves. From complex omni-channel retail systems to simple pop-up setups, BIXOLON’s experience within the retail environment means that they can provide tailored printing solutions for independent traders through to major retailers. Key product highlights will include: SRP-Q300 Series – BIXOLON’s first 3-inch (80mm) Direct Thermal compact Receipt and Ticket printer, with flexible mPOS configuration capabilities. Including the SRP-Q300H featuring an intelligent hub (B-gate), connecting up to 4 USB peripheral devices (scanner, cash drawer, customer display, RFID reader, scales, etc.) to the host tablet (via Bluetooth) and providing a single charging port. Printing receipts or online orders through a native, web and cloud-based mPOS application with B-gate SDK’s (Software Development Kits). BIXOLON will be pairing the printer with its new LCD customer Display (BCD-3000) and a robust steel tablet stand which safely secures up to a 10inch tablet using a locking mechanism and 170° forward-tilting feature to provide a complete hospitality mPOS solution. SLP-TX400R - 4-inch desktop label printer with RFID technology, supporting both direct thermal and thermal transfer printing at speeds up to 7 IPS. Supporting USB, Ethernet, and Serial, with optional Bluetooth or WLAN interface. Alongside an optional auto-cutter and external label holder for higher-volume label rolls. Ideal for simultaneously printing and embedding UHF RFID codes into inventory labelling, price tags and more. SPP-L3000 – showcasing its extensive range of 2”, 3” and 4” mobile printing solutions including the NEW SPP-L3000 launching later this year. A compact, lightweight 3-inch industrial mobile printer, fully compatible with market-leading languages and is ideal for supply chain labelling, retail tags, delivery invoicing and more “BIXOLON will be joined on the stand by GoEPOS who will be demonstrating the world’s first iPad POS app operating a complete EPOS terminal system including a USB Magnetic Dallas fob reader, USB 1D & 2D barcode scanners and any USB customer pole display through the BIXOLON B-gate printer with built in mPOS hub to provide a complete EPOS system,” explains Charlie Kim, Managing Director, BIXOLON Europe GmbH. “This collaboration highlights the versatility of BIXOLON’s intelligent printing solutions producing a new generation of Retail EPOS.” - o - About BIXOLON BIXOLON is a leading global manufacturer of innovative, advanced printing technologies including point-of-sale receipt, label, Auto ID and mobile printers for a wide range of environments. Millions of BIXOLON printers are used today in retail, hospitality, healthcare, banking, ticketing, post/parcel, warehousing and other transaction-intensive industries. In 2017, for the fourth consecutive year BIXOLON was named global mobile receipt printer market leader by Japanese research company Chunichisha, securing a 32.9% market share. For more information visit http://www.bixolon.com or contact your local BIXOLON sales representative. 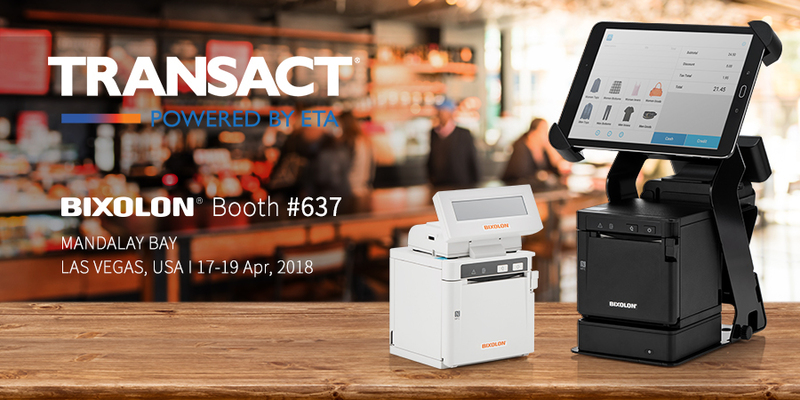 ETA TRANSACT (17th – 19th April 2018, Las Vegas, USA) – BIXOLON Co., Ltd (booth #637) a global leading mobile, label and POS printer manufacturer will be encouraging its visitors to explore its latest range of mobile point-of-sale and payment printing solutions for the American market at ETA TRANSACT 2018. 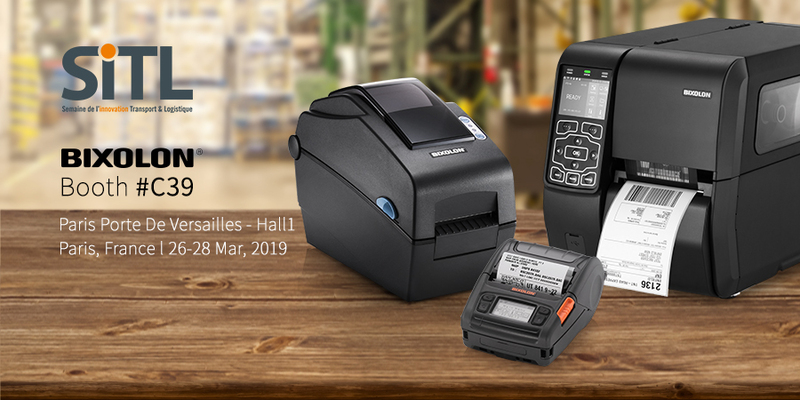 At the heart of BIXOLON’s exhibition line-up is the company’s new mPOS desktop printer and its steady-selling range of receipt and linerless label mobile printers for payment receipting, banking receipting and delivery invoice printing applications. 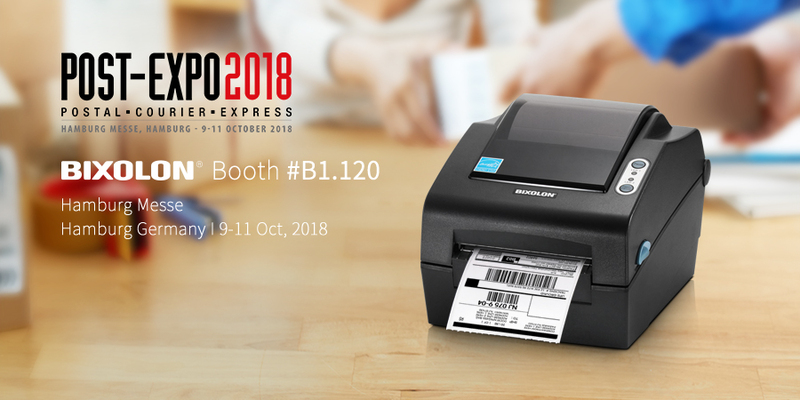 Learn more about BIXOLON’s exhibition line-up SRP-Q300 Series: BIXOLON’s first 3-inch (80mm) Direct Thermal compact Receipt and Ticket printer, with flexible mPOS configuration capabilities. Including the SRP-Q300H featuring an intelligent hub (B-gate), connecting up to 4 USB peripheral devices (scanner, cash drawer, customer display, RFID reader, scales, etc.) to the host tablet (via Bluetooth) and providing a single charging port. Printing receipts or online orders through a native, web and cloud-based mPOS application with B-gate SDK’s (Software Development Kits). BIXOLON will be pairing the printer with its new LCD customer Display (BCD-3000) and a robust steel tablet stand which safely secures up to a 10inch tablet using a locking mechanism and 170° forward-tilting feature to provide a complete customer engagement solution. BIXOLON’s Mobiles: Named four times the world’s number 1 Mobile Receipt Printer Manufacturer*, BIXOLON’s innovative range of mobile printing solutions will inspire the visitors of ETA TRANSACT. Introducing the SPP-R210 slim 2-inch MFi Bluetooth and Wi-Fi mobile printer. Alongside the SPP-R200III 2-inch mobile printer, SPP-R310 3-inch mobile printer and SPP-R410 4-inch mobile printer encompassing linerless labelling capabilities and NFC Auto Pairing Technology. BIXOLON mobile printers are designed for fast printing performance in high-transaction on-the-go environments. “ETA TRANSACT is truly a ground-breaking event at the intersection of mobile, retail and payments,” states Alberto Hwang, Managing Director at BIXOLON America. “We are looking forward to engaging with the best of the best in the payments transaction industry throughout the show.” About BIXOLON BIXOLON is a leading global manufacturer of innovative, advanced printing technologies including point-of-sale receipt, label, Auto ID and mobile printers for a wide range of environments. Millions of BIXOLON printers are used today in retail, hospitality, healthcare, banking, ticketing, post/parcel, warehousing and other Transaction-intensive industries. *In 2017, for the fourth consecutive year BIXOLON was named global mobile receipt printer market leader by Japanese research company Chunichisha, securing a 32.9% market share. For more information visit http://www.bixolon.com or contact your local BIXOLON sales representative. 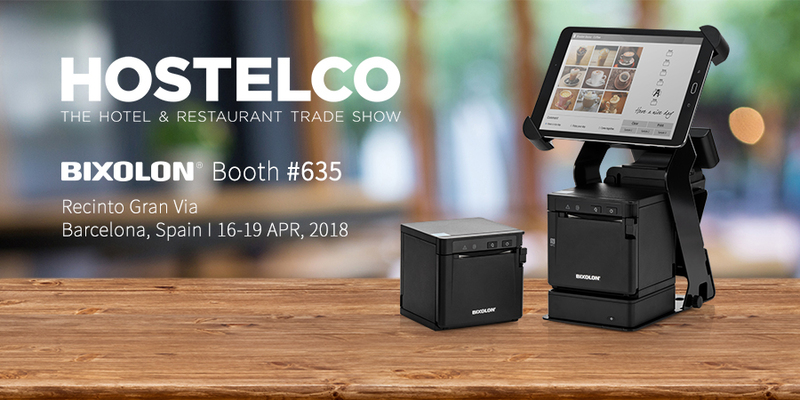 Hostelco 2018 (16th – 19th April 2018, Barcelona, Spain) – BIXOLON a global leading Mobile, Label and POS printer manufacturer will be inviting visitors to discover its growing portfolio of dynamic printing solutions for the evolving hospitality marketplace on its stand at Hostelco 2018 (Gran Via, Hall 7, Level 0, Street F, Stand 635). Showcasing the latest in hospitality receipting, labelling and ticketing, including BIXOLON will be exhibiting the SRP-F310II front exit, 3-inch direct thermal printer with an ergonomic splash proof design. The SRP-330II 3-inch budget level direct thermal POS printer. Printing at speeds up to 220mm/second with 180 or 203dpi print resolution, providing exceptional value compared to other printers in its class. The SRP-275III 3-inch serial dot-matrix receipt printer ideal for a range of applications from kitchen printing, end-of-day reporting and customer receipting. Alongside the SLP-DX220 2-inch compact direct thermal label printer perfect for a range of applications from wristbanding and delivery labelling. 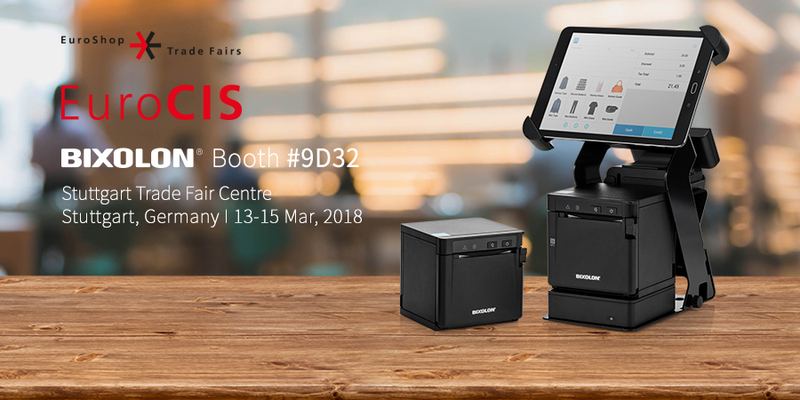 BIXOLON will also be demonstrating its next generation in mPOS printing, exhibiting its SRP-Q300H 3-inch (80mm) Direct Thermal cube receipt and ticket printer. Featuring BIXOLON’s intelligent B-gate connectivity hub, connecting to the host tablet device (via Bluetooth) while supporting 1 charging port and up to 4 USB peripherals (scanner, cash drawer, customer display, RFID reader, scales, etc.). Printing receipts or online orders through a native, web and cloud-based mPOS application with B-gate SDK’s (Software Development Kits). BIXOLON will be pairing the printer with its new LCD customer Display (BCD-3000) and a robust steel tablet stand which safely secures up to a 10inch tablet using a locking mechanism and 170° forward-tilting feature to provide a complete hospitality mPOS solution. BIXOLON’s innovative range of mobile printing solutions will inspire the visitors of Hostelco. Including its SPP-R200III 2-inch mobile printer, plus SPP-R310 3-inch mobile printer with linerless labelling capabilities and NFC Auto Pairing Technology, ideal suited for hospitality table service and mobile payments. “As the requirement to connect tablet devices or hand-held terminals to an EPOS system quickly becomes the norm in many traditional and contemporary Hospitality set-ups,” explains Charlie Kim, Managing Director, BIXOLON Europe GmbH. “BIXOLON is continually looking for innovative ways to diverse and evolve its printing solutions to drive the hospitality printing market.” About BIXOLON BIXOLON is a leading global manufacturer of innovative, advanced printing technologies including point-of-sale receipt, label, Auto ID and mobile printers for a wide range of environments. Millions of BIXOLON printers are used today in retail, hospitality, healthcare, banking, ticketing, post/parcel, warehousing and other transaction-intensive industries. In 2017, for the fourth consecutive year BIXOLON was named global mobile receipt printer market leader by Japanese research company Chunichisha, securing a 32.9% market share. For more information visit http://www.bixolon.com or contact your local BIXOLON sales representative. 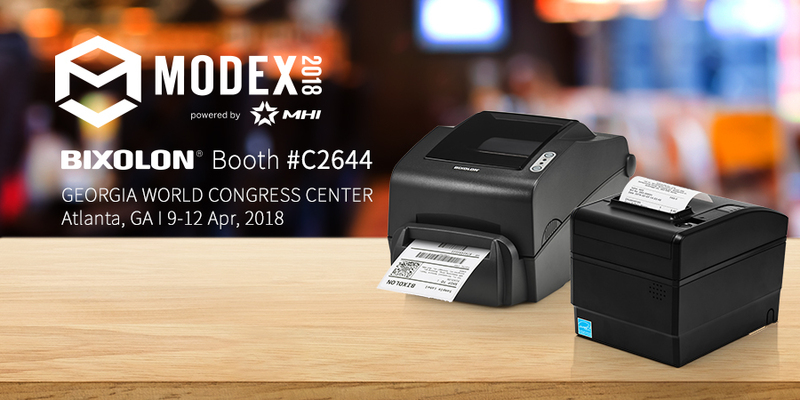 The MODEX – BIXOLON Co., Ltd a global leading mobile, label and POS printer manufacturer will be encouraging its visitors to explore the latest in Supply Chain and Logistics’ printing solutions for the American market on BIXOLON’s booth #C2644 at MODEX 2018. At the heart of the lineup is the company’s new mobile label printer, desktop RFID label printer and sticky label printer for warehouse management, field logistics and manufacturing label and delivery note printing applications. Meet BIXOLON’s Latest Auto ID printers: SPP-L3000: BIXOLON’s first 3-inch thermal mobile label printer SPP-L3000 with 5 IPS speed launching in 2018. Featuring an integrated easy-to-open peeler, the SPP-L3000 is fully compatible with market-leading programming languages. Sporting a compact, lightweight, industrial design with IP65 and 6 ft. drop spec. The printer also supports WLAN Dual band (5 GHz and 2.4 GHz), Bluetooth V 4.1 Classic and LE and NFC. The perfect printing solution for delivery invoicing, supply chain labelling and inventory management. SLP-TX400R: Recently launched, the 4-inch desktop label printer with RFID technology and 7 IPS speed. The SLP-TX400R supports USB, Ethernet and Serial with optional Bluetooth or WLAN interface. Alongside an optional auto-cutter and external label holder for higher-volume label rolls. Producing simultaneous print and embedded UHF RFID code into inventory labelling, price tags and more. SRP-S300: The SRP-S300 3-inch linerless label printer is designed for shipping labelling, mobile and online delivery order printing. Its dual interface includes optional Bluetooth or Wi-Fi capability. Featuring a flexible media options, the SRP-S300 supports linerless labels, alongside receipt paper with a scalable guide that supports use of 40mm, 58mm, 62mm, 80mm and 83mm paper widths for maximum versatility and low TCO. Alongside these new printing innovations, BIXOLON will also be demonstrating its range of compact, robust and intelligent Bluetooth desktop labelling solutions on the stand. Including its 2” SLP-DX220 and 4” SLP-DX420 desktop label printers and the specialised 4” SLP-DL410 Direct Thermal Bluetooth fan-fold label printer. “MODEX provides us with the platform to connect directly with the key players within the American Supply Chain industry,” states Alberto Hwang, Managing Director of BIXOLON America. “BIXOLON will be inspiring the visitors of MODEX with the latest and most innovative AIDC printing technologies, including its market leading mobile printers specifically designed for linerless labelling.” About BIXOLON BIXOLON is a leading global manufacturer of innovative, advanced printing technologies including point-of-sale receipt, label, Auto ID and mobile printers for a wide range of environments. Millions of BIXOLON printers are used today in retail, hospitality, healthcare, banking, ticketing, post/parcel, warehousing and other transaction-intensive industries. In 2017, for the fourth consecutive year BIXOLON was named global mobile receipt printer market leader by Japanese research company Chunichisha, securing a 32.9% market share. For more information visit http://www.bixolon.com or contact your local BIXOLON sales representative. LogiMAT 2018 (13th – 15th March 2018, Stuttgart, Germany) – BIXOLON Co., Ltd a global leading Mobile, Label and POS printer manufacturer will be exhibiting the latest in warehouse management, field logistics and manufacturing label, receipt and ticket printing in Hall 6 stand F16 at LogiMAT 2018. Making a number of exciting announcements on the stand, BIXOLON will be showcasing the NEW SPP-L3000, mobile label printer. Its first 3-inch embedded Linux mobile printer with 5 IPS speed launching in 2018. SPP-L3000 is compact, lightweight mobile printer with an easy-to-open peeler. Supporting WLAN Dual band (5 GHz and 2.4 GHz), Bluetooth V 4.1 Classic and LE. The perfect printing solution for delivery invoicing, supply chain labelling, inventory management and more. Also ahead of its launch later this year, BIXOLON will also be showcasing the NEW SLP-TX400R. A 4-inch desktop label printer with RFID technology, supporting both direct thermal and thermal transfer printing at speeds up to 7 IPS. SLP-TX400R supports USB, Ethernet, and Serial, with optional Bluetooth or WLAN interface, alongside an optional auto-cutter and external label holder for higher-volume label rolls. Ideal for simultaneously printing and embedding UHF RFID codes into inventory labelling, ID verification and more. “Logistics has always been an important sector for BIXOLON. LogiMAT provides us with the platform to connect directly with the key players within the European Logistics industry,” states Charlie Kim, Managing Director, BIXOLON Europe GmbH. “BIXOLON will be joined on the stand by its partner Almex who will be showcasing their logistics solution supported by BIXOLON printing hardware.” BIXOLON will also be demonstrating its range of compact, robust and intelligent Bluetooth Direct Thermal and Thermal Transfer desktop labelling solutions on the stand. Including its 2” SLP-TX220 and SLP-DX220 and 4” SLP-TX420 & SLP-DX420. The specialised 4” SLP-DL410 Direct Thermal Bluetooth fan-fold label printer. The 4” SLP-TX400 and SLP-T400 high throughput desktop labelling printers. BIXOLON’s desktop labelling solutions are fully compatible with market-leading programming languages such as SLCS, BPL-Z™ and BPL-E™ and support label printing from popular applications such as Bartender®. Inspiring the visitors of LogiMAT with the latest and most innovative mobile printing technologies, BIXOLON will be showcasing its market leading 2”, 3” and 4” mobile printers. Including its next generation 4-inch mobile printer, the SPP-R410 with optional transmissive sensor. Supporting both wireless and wired connectivity options including Bluetooth, Wi-Fi, USB and Serial. The SPP-R410 is ideally suited for warehouse inventory and field support applications. About BIXOLON BIXOLON is a leading global manufacturer of innovative, advanced printing technologies including point-of-sale receipt, label, Auto ID and mobile printers for a wide range of environments. Millions of BIXOLON printers are used today in retail, hospitality, healthcare, banking, ticketing, post/parcel, warehousing and other transaction-intensive industries. In 2017, for the fourth consecutive year BIXOLON was named global mobile receipt printer market leader by Japanese research company Chunichisha, securing a 32.9% market share. For more information visit http://www.bixolon.com or contact your local BIXOLON sales representative. 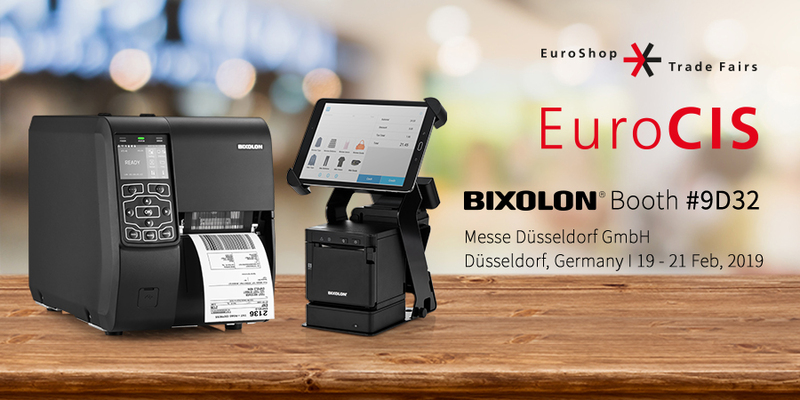 EuroCIS 2018 (27th February – 1st March 2018, Düsseldorf, Germany) – BIXOLON Co., Ltd a global leading Mobile, Label and POS printer manufacturer will be encouraging its visitors to explore and learn more about its latest mPOS, Retail, Supply Chain, Postal and Label printing solutions for the European market on stand 9D32 at EuroCIS 2018. Demonstrating the multi-talented SRP-Q300 series range, BIXOLON’s first 3-inch (80mm) Direct Thermal cube Receipt and Ticket printer. Including the SRP-QE300 entry-level printer with USB and Ethernet connectivity, plus 200mm/sec print speeds and 180dpi print resolution. The SRP-Q300 USB and LAN printer with 180dpi or 203dpi (SRP-Q302) and speeds up to 220mm/sec. Alongside the Bluetooth SRP-Q300BK and WiFi SRP-Q300WK connectivity options. The SRP-Q300H features BIXOLON’s intelligent B-gate connectivity hub, connecting to the host tablet device (via Bluetooth) while supporting 1 charging port and up to 4 USB peripherals (scanner, cash drawer, customer display, RFID reader, scales, etc.). Printing receipts or online orders through a native, web and cloud-based mPOS application with B-gate SDK’s (Software Development Kits). BIXOLON will be pairing the printer with its new LCD customer Display (BCD-3000) and a robust steel tablet stand which safely secures up to a 10inch tablet using a locking mechanism and 170° forward-tilting feature to provide a complete retail mPOS solution. “BIXOLON is always looking to the future of POS by pushing the boundaries of design and technology,” states John Kim, Marketing Director, BIXOLON. “The SRP-Q300 Series is an example where style, functionality and connectivity can be tailored to individual budgets and application requirements providing retailers with a highly functional printing solution without a large hardware investment.” Celebrating its fourth year as the World’s Number One Receipt Printer Manufacturer*, BIXOLON will be showcasing the NEW SPP-L3000. Its first 3-inch embedded Linux mobile printer with 5 IPS speed launching in 2018. SPP-L3000 is compact, lightweight with an easy-to-open peeler. Supporting WLAN Dual band (5 GHz and 2.4 GHz), Bluetooth V 4.1 Classic and LE. Perfect for delivery invoicing, supply chain labelling, shelf tags and more. Ahead of its launch later this year, BIXOLON will also be showcasing the NEW SLP-TX400R. A 4-inch desktop label printer with RFID technology, supporting both direct thermal and thermal transfer printing at speeds up to 7 IPS. SLP-TX400R supports USB, Ethernet, and Serial, with optional Bluetooth or WLAN interface. Alongside an optional auto-cutter and external label holder for higher-volume label rolls. Ideal for simultaneously printing and embedding UHF RFID codes into inventory labelling, price tags and more. Technology Partners BIXOLON will host a range of technology hardware and software partners, including IDP, Miura, Almex and The Factory HKA on its stand throughout the show. “BIXOLON celebrates its ongoing successful partnerships with a range of organizations, demonstrating the flexibility of its solutions to the evolving technology marketplace,” explains Charlie Kim, Managing Director, BIXOLON Europe GmbH. “Combining functionality with changing consumer requirements BIXOLON forges strong relationships with high level organizations from an array of industries.” - o - About BIXOLON BIXOLON is a leading global manufacturer of innovative, advanced printing technologies including point-of-sale receipt, label, Auto ID and mobile printers for a wide range of environments. Millions of BIXOLON printers are used today in retail, hospitality, healthcare, banking, ticketing, post/parcel, warehousing and other transaction-intensive industries. In 2017, for the fourth consecutive year *BIXOLON was named global mobile receipt printer market leader by Japanese research company Chunichisha, securing a 32.9% market share. For more information visit http://www.bixolon.com or contact your local BIXOLON sales representative. 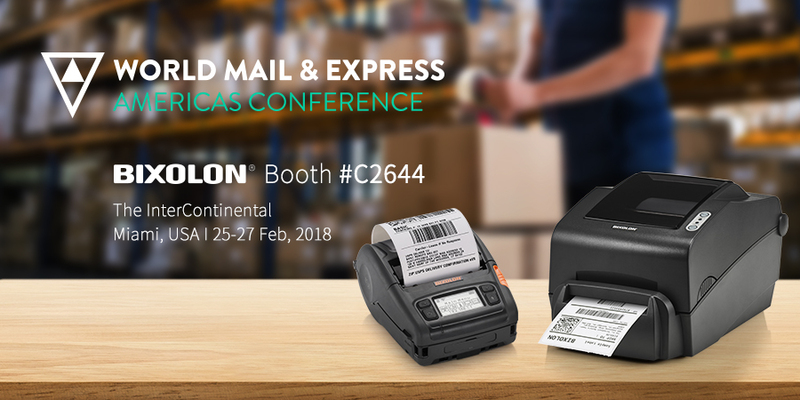 The World Mail & Express (WMX) Americas Conference (25th – 27th February 2018, Miami, USA) – BIXOLON Co., Ltd a global leading mobile, label and POS printer manufacturer will be encouraging its visitors to explore the latest E-Commerce Postal and Supply Chain’s printing solutions for the American market at BIXOLON’s keynote and on booth #18 at WMX 2018. The e-commerce market is booming with experts forecasting global B2C e-commerce sales to surpass $2 trillion by 2018. This explosion in e-commerce is driving a significant growth in home delivery and given rise to new customers with new needs, expectations and challenges. For home delivery service providers, the evolving customer landscape represents an opportunity to develop a sustained competitive advantage, retain customers and expand their customer base. Mark Hernandez, Director of AIDC Solutions of Bixolon America Inc., will be a keynote speaker at the show discussing ‘Next Generation Challenges for Home Delivery’ at 15:10 pm on Tuesday February 27. From this keynote the audience will explore the changing needs of the next generation customer. Discuss the emerging set of challenges facing home delivery providers and share essential knowledge to overcome the challenges and develop a forward-looking roadmap to harness the changing landscape and generate a sustainable market growth. Meet BIXOLON’s Latest mobile and label printer line-up: SPP-L3000: BIXOLON’s first 3-inch embedded Linux mobile printer SPP-L3000 with 5 IPS speed will be coming in 2018. SPP-L3000 is compact, lightweight with an easy-to-open peeler and supports WLAN Dual band (5 GHz and 2.4 GHz), Bluetooth V 4.1 Classic and LE. Perfect for delivery invoicing, supply chain labelling, shelf tags and more. SLP-TX400R: Just launched the 4-inch desktop label printer with RFID technology and 7 IPS speed. SLP-TX400R supports USB, Ethernet, and Serial, with optional Bluetooth or WLAN interface alongside an optional auto-cutter and external label holder for higher-volume label rolls. Simultaneously printing and embedding UHF RFID code into inventory labelling, price tags and more. SRP-S300: The SRP-S300 3-inch linerless label printer is designed for shipping labelling, mobile and online delivery order printing. Its dual interface includes optional Bluetooth or Wi-Fi capability. And, with its flexible media options, the SRP-S300 supports linerless labels, alongside receipt paper with a scalable guide that supports use of 40mm, 58mm, 62mm, 80mm and 83mm paper widths for maximum versatility and low TCO. About BIXOLON BIXOLON is a leading global manufacturer of innovative, advanced printing technologies including point-of-sale receipt, label, Auto ID and mobile printers for a wide range of environments. Millions of BIXOLON printers are used today in retail, hospitality, healthcare, banking, ticketing, post/parcel, warehousing and other transaction-intensive industries. In 2017, for the fourth consecutive year BIXOLON was named global mobile receipt printer market leader by Japanese research company Chunichisha, securing a 32.9% market share. For more information, contact us at http://www.bixolon.com, or follow us on these social channels: Twitter, Facebook and YouTube. BIXOLON Co., Ltd. a leading global mobile, label and POS printer manufacturer, today announced the SLP-TX400R 4-inch desktop label printer with RFID technology. Supporting both direct thermal and thermal transfer printing at top printing speeds, the compact new model simultaneously prints and embeds UHF RFID code into a wide range of label types and sizes ─ from merchandise hang tags, inventory palette and case labels to wristbands and more ─ making it an ideal choice for retail, hospitality, warehousing, logistics and other applications that require rapid, secure and accurate identification of assets. Working with the application, the SLP-TX400R seamlessly prints traditional text, graphics and 1D/2D barcodes while simultaneously embedding EPC code (serial number, stock number, production date and other unique ID information) onto the label. “With omnichannel retailing moving at warp speed, there’s a critical need for stores to gain efficiency, visibility and accurate inventory tracking to stay competitive,” cited John Kim, BIXOLON director of marketing. “A great buying experience can be ruined by inventory or delivery errors. The SLP-TX400R ensures the fastest desktop label printing with the right RFID data encoded in every tag.” Features & Functionality Compatible with UHF EPC Class 1, Gen 2 RFID labels (ISO18000-06C) Best-in-class printing and encoding speed of 7 IPS for 203 dpi printing Direct thermal and thermal transfer printing at 203 dpi and 300 dpi printing resolution Multi-interface support including USB, Ethernet, and Serial, with optional Bluetooth or WLAN support Unified Label Utility for rapidly configuring RFID labeling capabilities Label Artist™ custom label design program supports database connection as well as text, lines and boxes, graphics and barcode printing Smart Media Detection™ feature automatically detects the media type such as Gap Media, Black Mark Media and Short length Media paper Optional auto-cutter feature and external label holder for higher-volume label rolls About BIXOLON BIXOLON is a leading global manufacturer of innovative, advanced printing technologies including point-of-sale receipt, label and mobile printers for a wide range of environments. Millions of BIXOLON printers are used today in retail, hospitality, healthcare, banking, ticketing, post/parcel, warehousing and other transaction-intensive industries. In 2017, for the fourth year in a row, BIXOLON was named global mobile receipt printer market leader by Japanese research company Chunichisha, securing a 32.9% market share. For more information, contact us at http://www.bixolon.com, or follow us on these social channels: Twitter, Facebook and YouTube. BIXOLON America, Inc., a leading global mobile, label and POS printer manufacturer, will showcase its latest compact mobile point-of-sale (mPOS) printing solutions at the National Retail Federation (NRF) Retail’s BIG Show, January 14-16 in New York City. At the heart of the lineup is the company’s new, space-saving cube printer series, including an intelligent hub model with tablet stand for flexible and cost effective “build your own mPOS” applications. Exclusive Look at BIXOLON’s Latest retailers visiting BIXOLON at the NRF Show (Booth #1403) will see the latest mPOS printing solutions in action and get a sneak peek at innovative mobile products coming in 2018. SRP-Q300 Series: Designed for retailers looking to support “click-and-collect” transactions, BIXOLON’s 3-inch thermal MPOS cube printer enables flexible mPOS receipt printing from Android™, iOS™ and Windows® mobile devices. Featuring BIXOLON’s intelligent B-gate hub technology, the SRP-Q300H model supports a range of accessories—including tablet stand, LCD customer display, card reader (MSR/SCR) and more—transforming it into a complete “build your own mPOS” solution. It connects to mobile devices via Bluetooth or Wi-Fi wireless communication while supporting a charging port and up to four USB peripherals. Designed to speed integration of mobile and online order printing from native, web and cloud-based applications, the SRP-Q300H is ideal for ISVs and developers looking to design their own POS environment, without the time and cost of developing peripheral drivers. Preview: Coming in 2018 SPP-L3000: A ruggedized 3-inch mobile printer ideal for retail warehousing and distribution applications, the SPP-L3000 provides on-the-go printing of labels, shelf tags and more. The SPP-L3000 also includes BIXOLON’S exclusive Label Artist™ Mobile software for fast and easy label design and printing from iOS and Android devices. SLP-TX400R: BIXOLON’s new 4-inch desktop label printer with RFID technology, the SLP-TX400R supports both direct thermal and thermal transfer printing. It simultaneously prints and embeds UHF RFID code into hang tags, inventory labels, wristbands, loyalty cards and more, making it an ideal choice for retail, warehousing and logistics applications. Technology Partners BIXOLON will host complementary hardware and software technology partners, including NCR Silver, Applied Data Corporation, Kontrolar, The Factory HKA, IDP and Miura Systems. BIXOLON printers will also be showcased at partner booth locations including Iconex, featuring the SRP-S300 and SPP-R310 printers in restaurant linerless labeling applications, Smart 4 B&R, showcasing an OXXO fuel dispenser with integrated SRP-Q302 receipt printer, and C&K Systems, showing an NCR CounterPoint all-in-one terminal with SRP-350plusIII receipt printer and SLP-DX220 label printer. About BIXOLON BIXOLON is a leading global manufacturer of innovative, advanced printing technologies including point-of-sale receipt, label and mobile printers for a wide range of environments. Millions of BIXOLON printers are used today in retail, hospitality, healthcare, banking, ticketing, post/parcel, warehousing and other transaction-intensive industries. In 2017, for the fourth year in a row, BIXOLON was named global mobile receipt printer market leader by Japanese research company Chunichisha, securing a 32.9% market share. For more information, contact us at http://www.bixolon.com, or follow us on these social channels: Twitter, Facebook and YouTube. TRUSTECH (28-30 November 2017, Cannes, France) - BIXOLON, a leading global manufacturer of advanced Mobile Label and POS printers, will be showcasing its latest range of dynamic printing solutions for a range of trend sensitive applications from digital payment commerce to multi-platforms to POS ecosystems on stand Palais 01 D 027 at TRUSTECH 2017. 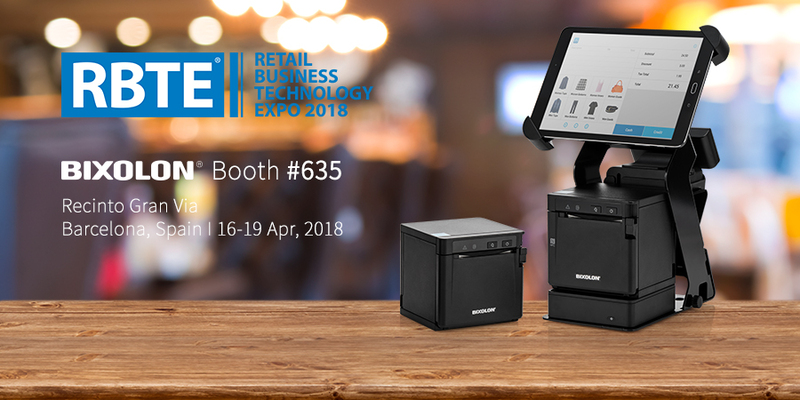 Redefining POS printing, BIXOLON will be exhibiting its NEW SRP-Q300 3-inch (80mm) Direct Thermal cube desktop printer offering flexible mPOS receipt printing from Android™, iOS™ and Windows® mobile devices throughout the show. Showcasing BIXOLON’s B-gate mPOS hub solution on the SRP-Q300H, the mPOS hub seamlessly connects to the host tablet device (via Bluetooth or Wi-Fi wireless communication) while supporting one charging port and up to 4 USB peripherals (scanner, cash drawer, customer display, RFID reader, scales, etc.). Available to print receipts or online orders through native, web and cloud-based mPOS application with B-gate SDKs. This remarkable printing hardware creates a complete mPOS solution with a smaller footprint and competitive pricing. 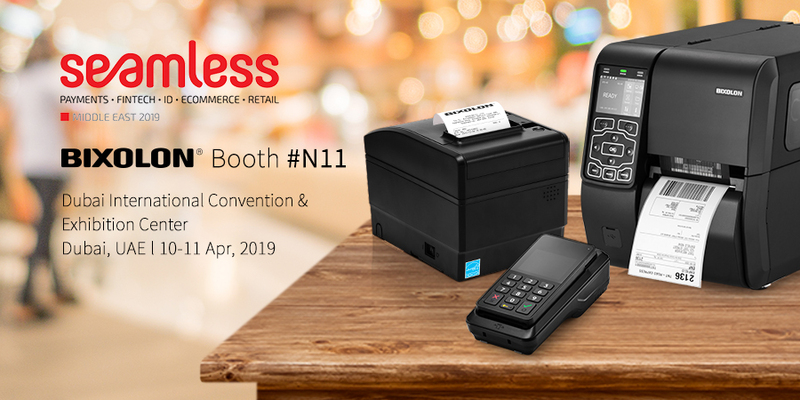 Showcasing dynamic printing solutions for the evolving payments market, BIXOLON also will be demonstrating its comprehensive range of 2”, 3” and 4” mobile printing solutions including the newly released next generation highly connectable 4-inch mobile printer, the SPP-R410. 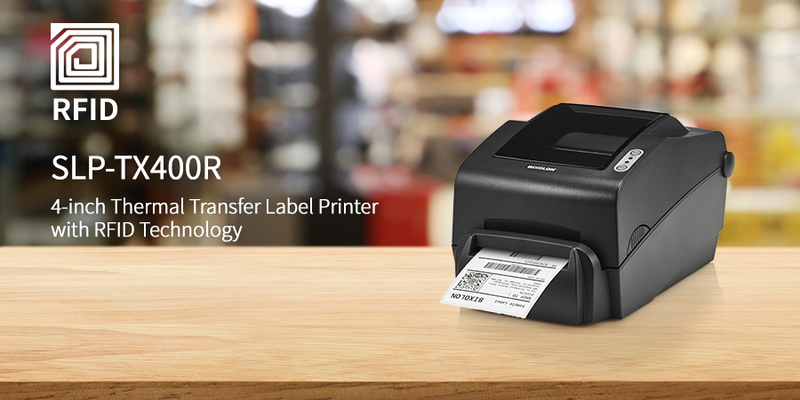 Supporting both wireless and wired connectivity options including Bluetooth, Wi-Fi, USB and Serial, BIXOLON mobile printers are ideal printing hardware for a retail payment and on-the-go printing applications. BIXOLON will be joined on the stand by MobiWork a mobile workforce solutions software provider aiding any business with employees in the field increase productivity and visibility in their operations. MobiWork will be demonstrating its mobile POS field sales solution, alongside its field security and asset management solutions applications supporting printing from BIXOLON SPP-R310 and SPP-R200III thermal mobile receipt printers. “Europe continues to be one of the fastest growing payment markets in the world,” explains Charlie Kim, Managing Director, BIXOLON Europe GmbH. “BIXOLON continues to invest heavily into payment printing research and development, to provide sophisticated, flexible Mobile, POS and Label printing solutions to meet evolving customer requirements.” - o - About BIXOLON BIXOLON is a leading global manufacturer of dependable innovative and advanced printing technologies that include POS, Auto ID and Mobile receipt & label printers for a range of environments. BIXOLON views its printing technology as an essential tool for any business and holds itself to the highest standards, since dedication to customers is its core belief. BIXOLON’s FAST, FLEXIBLE and FRIENDLY approach to business has much to do with its recent success. For more information visit http://www.bixolon.com or contact your local BIXOLON sales representative. 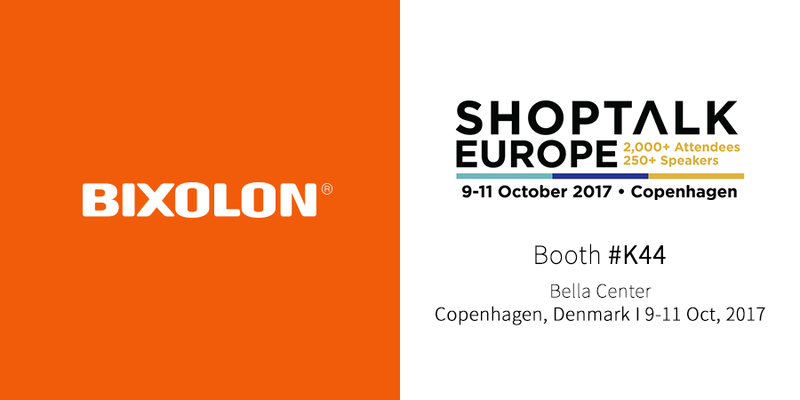 ShopTalk 2017 (9-11 October 2017, Copenhagen, Denmark) – BIXOLON, a leading global manufacturer of advanced Mobile Label and POS printers, will be demonstrating the latest in Retail printing technology for a range of applications from digital payment to multi-channel retailing on stand K44 at ShopTalk 2017. Inspiring retailers with the future of POS receipt printing, BIXOLON will be exhibiting its NEW SRP-Q300 3-inch (80mm) Direct Thermal cube desktop printer offering flexible mPOS receipt printing from Android™, iOS™ and Windows® mobile devices. Showcasing a front-exit printing, ultra-compact design, the SRP-Q300 is designed to free up counter space and compliment the latest mPOS systems. “As the retail technology market continues to evolve, we’re excited to be demonstrating our mPOS hub solution at the show,” cites Charlie Kim, Managing Director of BIXOLON Europe GmbH. “B-gate mPOS hub seamlessly connects to the host tablet device (via Bluetooth or Wi-Fi wireless communication) while supporting one charging port and up to 4 USB peripherals (scanner, cash drawer, customer display, RFID reader, scales, etc.). Available to print receipts or online orders through native, web and cloud-based mPOS application with B-gate SDKs. This remarkable printing hardware creates a complete mPOS solution with a smaller footprint and competitive pricing.” BIXOLON will also be championing its sophisticated range highly connective POS, Label and mobile printing solutions throughout the show. Including its comprehensive range of 2”, 3” and 4” mobile printing solutions involving the newly released next generation highly connective 4-inch mobile printer, the SPP-R410. Alongside the SRP-S300 Linerless label and receipt printer. - o - About BIXOLON BIXOLON is a leading global manufacturer of dependable innovative and advanced printing technologies that include POS, Auto ID and Mobile receipt & label printers for a range of environments. BIXOLON views its printing technology as an essential tool for any business and holds itself to the highest standards, since dedication to customers is its core belief. BIXOLON’s FAST, FLEXIBLE and FRIENDLY approach to business has much to do with its recent success. For more information visit http://www.bixolon.com or contact your local BIXOLON sales representative.